In just a couple of hours, 2008 will be history. And we'll have a brand new year. While it's generally been one of the toughest years ever, I am grateful for many many things. Not least of all, the wonderful comments I've gotten from you guys. I wish everyone a fabulous 2009 filled with good fortune, good health and happiness. May you also achieve all the new resolutions you can dream of! 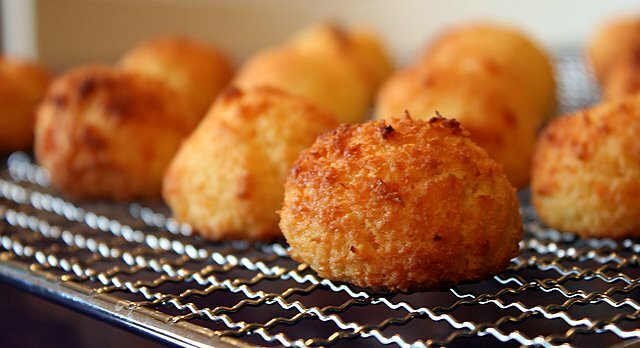 And for all-"round" good luck, here are some crispy coconut and mozzarella cheese bites. Recipe from Lidl Treats. Though I'm not a fan of coconut, but with mozzarella, that's a different story. LIC: A food-ful year to you too! =) Well, apart from WOW, my family was actually quite ill near the Christmas period. All of us retching one by one. That sure put paid to any nice food enjoyment/blogging! Didally, LCOM and Katie: Thanks and HNY too! I hope I get more good food in 2009 too!